Graduated Superior in Digital Design and Graphic Design (Promotion 2002 – 2007) in the School of Design ESDi, center associated with the URL. Official Degree in Composition with NukeX at the school Trazos de Madrid in 2010. His career moves in two areas graphic design for TV (Motion Graphics) and audiovisual postproduction. 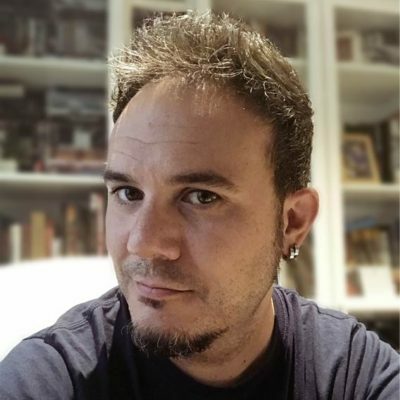 As a freelance works and has worked for several producers such as Goroka, Potato, Fake Studio, Mago productions, Urano Films, Lavinia, Marcial TV, Molinare, Vowel, Carambola Dreams, with projects for different TV channels like RTVE, Movistar +, BTV, TV3, Tele5, Canal +, MTV, or brands such as Pioneer, RedBull, Estrella Damm, Gallo, Danone, Ikea, Gas Natural. He is currently part of the postproduction team of the television program “Página2” and “¡Qué Animal!” of RTVE and the “Deuwatts” program of BTV. As a teacher he has worked between 2010 – 2014 in the IDEC 3D Animation Master (UPF). He currently works as a teacher at ESDi.